I am living proof that you’re never too old to learn. Just when I think I’ve learned everything about digital art, I learn something new. Like these caricatures. I just started playing around with the RadWarp tool one day and came up with these characters. Life is never boring for me! Below are eight different photos that I used to create my caricatures. For anyone interested in knowing how to create your own caricatures using PaintShop Pro X6, here’s how: (1.) Pull up your image. (2.) Crop it. (3.) Erase all the background as close and neatly to the image as possible. (4.) Go to Effects in your toolbar at the top of the page. (5.) Go down to Plugins, then over to the KPT Collection, then over to RadWarp. For more detailed effects, use the Warp Brush on the left vertical tool bar. If you’ve never used the warping tools before, it will take a truckload of practice and a ton of patience. But you can do it! It took me, off and on, several years before I finally got the hang of it. Just like working with other effects, you have to change the settings in your toolbar at the top (Opacity, Thickness, Density. Hardness) to get the desired look you want. When creating a caricature, just have fun with it. You can make yourself and others laugh all day long at what you come up with. Even creating caricatures of children is fun. The sky’s the limit what you can create. Caricatures make great bookmarks and cards that I’ll be posting soon. I don’t know who I was snarling at that day, my husband probably. Anyhow, I had fun creating this Roaring 20’s gal. I gave this one a cartoony look. I love playing up the eyes and cheekbones. Don’t you love that nose? I mean the one on the caricature! While creating these caricatures, familiar faces started emerging. This caricature reminds me of a sweet little lady from my childhood. I told everyone that I was going to be an Old Maid just like her when I grew up. Well that silly notion flew out the window! Okay. Now you know. I’m an alien. I landed on earth a thousand years ago. I park my spaceship in the neighbors garage. I thought of going back to Mars, but I forget how to get there. Besides, I don’t see well enough to drive at night. So I guess I’ll just hang around here another thousand years or so. In case you’re wondering, I was giving my husband “that look.” I don’t like having my picture taken, especially when I look like somebody’s great-grandmother. 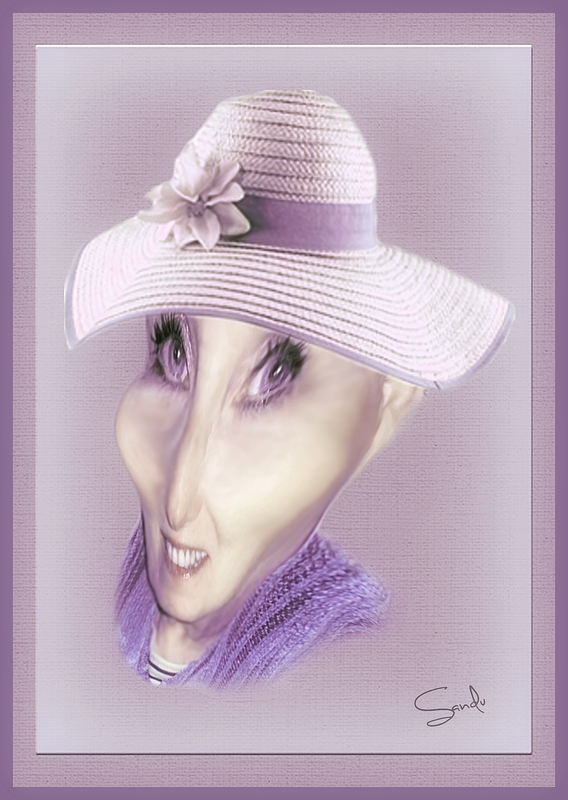 But it worked out perfectly for my alien grandmother caricature, don’t you think? Well I hope you had fun with my people. Thanks for stopping by!